If your rear wheel hangs out too far with the tailgate removed, another option might be to get a 2"x6" that is as long as the bike and run the bike up into the bed the length of it so that the weight of the bike holds it in. I would think that as long as the board was only supporting a couple of inches of the very back of the bike you would be okay. One more thing I just thought of- whenever I'm hauling a big, heavy bike like the 990, I usually do a 4-point tie down. You'll need 4 soft-ties and some ratcheting straps work best. Loop 2 of the soft-ties around the bottom triple clamp so that the hooks of the tie downs clear the fairing and front fender. On the 990 the rear grab handles make a great tie-down mount as long as you use soft ties. Putting the bike straight in and doing the 4 point tie down will make the bike rock-solid for the ride down the twisty AR roads that you'll be on to get to Mulberry, and the best part is that the kickstand will be up and your engine case will be intact when you arrive! kendall_smith wrote: whenever I'm hauling a big, heavy bike like the 990, I usually do a 4-point tie down. I can vouch for the importance of a 4-point tie-down. Last Friday, I was on my home from Randy's house with my F800GS strapped at all 4 corners to the right-hand rail of his 3-rail trailer. While making a left turn, the trailer tipped up onto one wheel at about a 45 degree angle. The only thing that kept it from tipping completely on its side was the front tie-down bar that extends at least a foot on either side of the rails. I thought the terrible scraping sound I heard was my bike dragging on the pavement. As soon as I hit the brakes and completed the left turn, the trailer righted itself, and I pulled over to survey the damage. The bike hadn't shifted one bit, but I won't make the mistake of leaving a single, 500-pound bike on one side of a trailer again, 4-point tie downs or not! Chad, Colleen, & me will be there late Thursday. I'll bet that was quite the show for the cars around you! 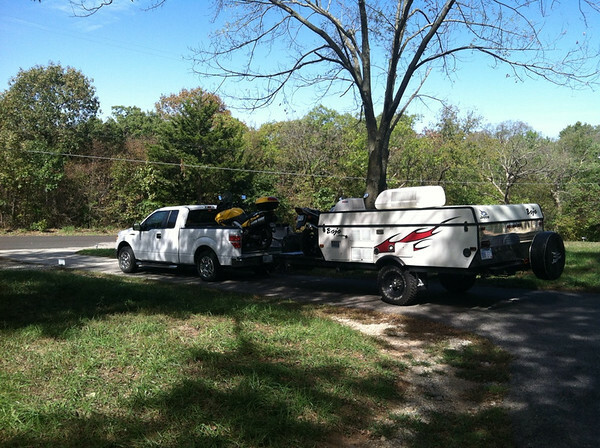 I do a 4-point tie down on all 3 bikes in the back of our toy hauler. I figure since I can't see the bikes while we're going down the road, it might be best to have some extra straps there to catch the bike if another strap fails. In the back of a pickup you usually have 4 tie-down points, so you might as well use them, especially with a heavy bike. 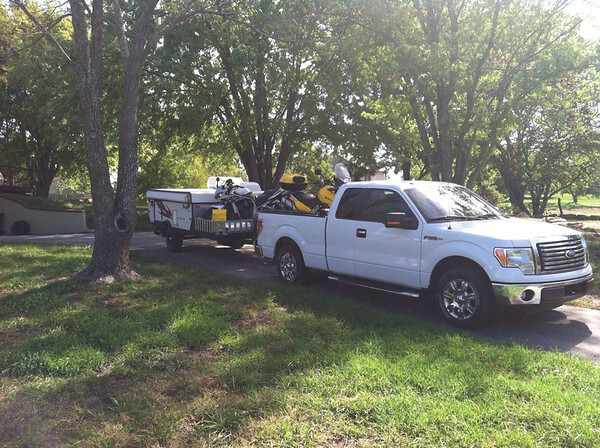 I will admit that I rarely tie down the back of the small bikes in the pickup though. I've hauled them thousands of miles and never really had a problem. Thanks Kendall - that was what I figured. Mine is 5.5ft (quad) bed so its really sticking out, probably at least a foot; I might try that board or 2x4 thingy when I get back and have time to dink with it and study it. I started thinking about my dual bike trailer and was wondering about how it would corner with just one bike on those roads. Your damn lucky Jasbaum! I was looking around for heavy stuff to tie to the other rail and decided screw it, I am riding. So I got the single person traveling camping gear out from the back of the garage & checked it out - strapped it on back of the bike. I plan to be at the Mullberry lodge by 9:30 Friday morning. Randy, I'd definitely like to tag along with you and your son. The weather forecast couldn't look any better............... especially after the weather that went through that area last night! That one is long gone, actually! 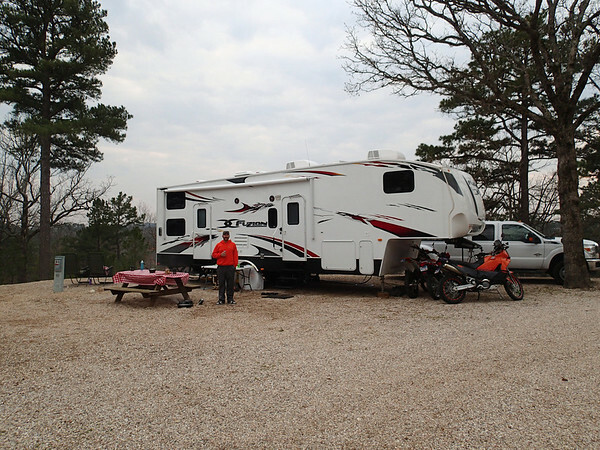 It was a 2007 Jayco Baja 10Y with the cargo deck on the front- awesome little setup if you can find one for sale. but we still miss the Baja sometimes! Bob Morgan wrote: The weather forecast couldn't look any better............... especially after the weather that went through that area last night! You guys got to miss out on the Severe Thunderstorm Warning and Tornado Watch we had here in Eureka Springs last night! At least the really bad stuff missed us to the south. First, let me say that y'all are welcome to ride whatever you want on Saturday. As previously stated, I don't recommend anyone follow me. However, you may do so at your own risk. If you choose, against better judgement, to follow me and you'd like the tracks I might be following, download the file below and load the items onto your GPS unit of choice. If you have any trouble, it's probably an ID10T error. Randy asked me to build a Saturday route, and it is included in this GPX file. 56 miles. Up the pipeline, into the Mill Creek system for a bit, then some fast forest roads to get way West where I'll take a gnarly trail down into Frog Bayou from the North. I'll HOPE to be able to cross the creek at the bottom. If the rivers are still up, there is VERY little chance this crossing will work and backtracking will be a long way. It's a risk you take if you follow me. You have been warned. Once down in Frog Bayou, I'll immediately climb back out a steep trail full of switchbacks. I don't recall it being crazy difficult, but others seem to recall it being something only to attempt downhill. I'll be trying it uphill....assuming I can get across that creek without being washed over the 10' waterfall. IF I get up to the road out of Frog Bayou, I'll start running down Bear Hollow Rd, which was closed by a landslide a few years back with, as I understood it, no plans to reopen. However, I've seen a few hints that folks are still running it. Last time I did, there was a sketchy bit of singletrack to get through the landslide area. It may not work out. Risk you take. IF Bear Hollow Rd works out, I plan to start down a fantastic ATV trail, but before that, there is an easy opportunity to run up to the White Rock Mtn lookout. This is very much worth it if you've not been there before. ....more road, more trail, a really nasty trail....then road down to Turner Bend Store. Should be less than 60 miles to the store, gas, and food. 14 miles from Turner Bend Store to the lodge the hard way. This runs up through Cove Creek and connects to the pipeline. "sat1" can be paired down from 60 miles to 40 by using "sat1-short". This track shortcuts the sat1 track. The other stuff are tidbits I might use for my Fri or Sun adventures. Of particular interest is the track named "A02_WUDI-ST" This is a ton of great singletrack from WUDI 2012. I can't be sure any or all of it is still open, but I'd like to ride it again for sure. The track named "explore" is a bit of really old roads and ATV stuff I played on in 2012 that I'd like to go explore more. I might do that Fri or Sun. You'll also find lots of Waypoints for things like the lodge, Oark General Store, Turner Bend Store, Mill Creek exit points, etc. The bit of trail runs directly through a walk-in turkey hunting area and has signs posting that the area is closed to motorized traffic during hunting seasons. We can check the signs when we are there and make the call. It will be easy to take road around the area to pick the track back up on the other side....but it is one of my favorite trails in the area. In fact, it is the final weekend of the month-long turkey season. I don't know hunting or hunters, but, final weekend combined with excellent weather me thinks the hunters might be out in force. Some of the other trail sections on the route might run us close to hunters not happy we are there. Drunk rednecks with guns and a bunch of Kansas City yahoos on dirt bikes -- what could possibly go wrong?! I think that is a rabbit gun. Now confirmed by a local that he knows of at least one group of turkey hunters planning to be in Frog Bayou this weekend. I do know that I have a group of students that have been turkey hunting Frog Bayou (Zone 2), and will be out there this weekend. They scouted it out last week and said they called up several birds. Although it is a big valley, it is steep on all but the one narrow opening where the Frog crosses Bidville Road. The sound really echos down in there. They are excellent shots and careful hunters and are not likely to accidentally shoot you. Everybody wear your turkey feather disguised helmets! troy wrote: Now confirmed by a local that he knows of at least one group of turkey hunters planning to be in Frog Bayou this weekend. That is all part of the adventure. troy wrote: First, let me say that y'all are welcome to ride whatever you want on Saturday. As previously stated, I don't recommend anyone follow me. However, you may do so at your own risk. If you choose, against better judgement, to follow me and you'd like the tracks I might be following, download the file below and load the items onto your GPS unit of choice. If you have any trouble, it's probably an ID10T error. Sounds like a fun ride to me!!!!! I'm in!